Titus 3, a photo by CMJimenez on Flickr. What are we doing? Good Works. - Can it be faked? - Has it been faked? - Is someone faking right now? - When words and deeds match, the Christian is being who God wants. - We are not to be the "frozen chosen"
- We are to affect the world and "turn it upside down"
- Oriented to people and ultimately to God, not the deeds themselves; the context bears this out. "The horse does not go before the cart." --YES, it does! Regeneration does not depend on works. How is it that we are saved? 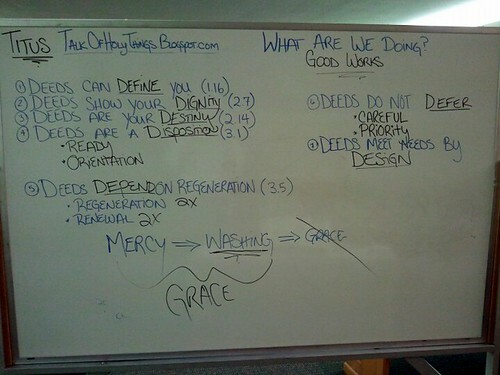 - Think about how to make deeds a priority -- remember, it is your employment as a Christian.